It is well-understood that a healthy diet is essential in supporting children to fulfill their potential. Eating the right food will help children to concentrate in class as well as helping them to feel good mentally and physically. Eating a well-balanced diet supports general health and helps build immunity to regular illnesses. However, in the longer term, a healthy diet along with regular exercise will help prevent life=threatening problems such as cancer, heart disease and diabetes. At Harlow Green, children can choose to eat school meals provided by Gateshead Catering Service. Meals provided in school meet strict nutritional standards which are regulated nationally. 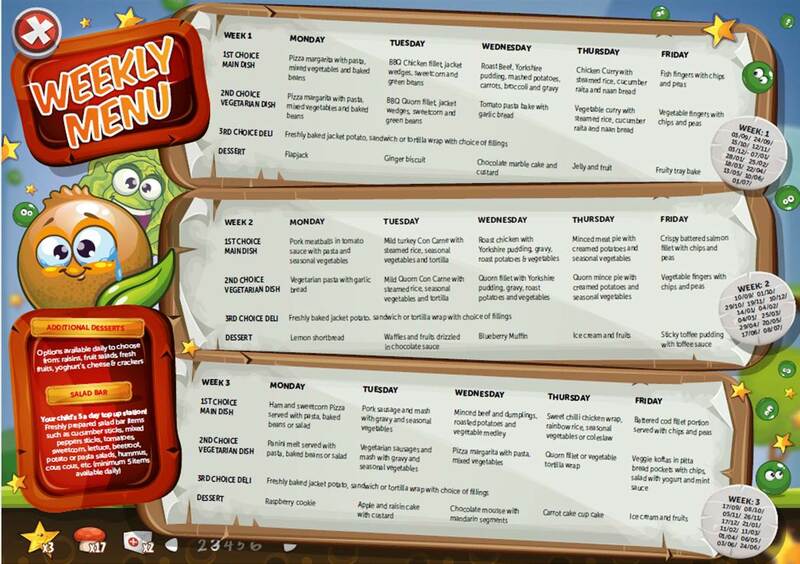 There are a variety of meals set out over a three week cycle. To provide flexibility, parent/carers can choose for their children to have a school meal any day of the week and interchange with a packed lunch option. The latest menu can be downloaded by clicking on the link below. Instead of eating school meals, children can bring packed lunches. Children eating packed lunch will do so with their friends in the lunch hall. We expect that parents/carers will support the school’s drive for healthy eating and will provide a healthy balance of food. We expect that children should have only one ‘treat’ per day (e.g. a biscuit or a packet of crisps). There are a number of children who have severe nut allergies at our school. Consequently, we would request that children do not bring in nuts or nut-based products (e.g. Nutella). In school, children should drink water. We encourage children to bring a bottle of water every day which they can access during lessons; this should not be flavoured water. Children should drink water at lunchtime also but may have a small juice to have with their meal (school meals and packed lunch). Under no circumstances should children bring in glass bottles or fizzy drinks. If parents/carers require any support in relation to health matters, particularly healthy eating, they should make contact with their child’s class teacher. The school will endeavour to support and will link in with expert agencies (e.g. the school nurse) that can help.